These lovable critters are a great way to introduce others to carving. They make great conversation starters. People can’t resist picking them up once they see them rolling down the table. They’re surprisingly easy to carve and after you get a feel for the technique, you’ll be able to create a whole herd in no time. I got my inspiration for these designs in 1987. I was teaching a woodcarving seminar in Anchorage, Alaska. One of the students brought in a small bear that was carved so that when you put it on a flat surface and nudged it from behind, it would roll over and land face up. I though this was an interesting idea and developed a number of carved animals that would do the same thing. I hope you enjoy this project as much as I did! CLICK HERE to download the Rolling Caricatures Pony Pattern. CLICK HERE to download the Rolling Caricatures Elephant Pattern. CLICK HERE to download the Rolling Caricatures Bison Pattern. 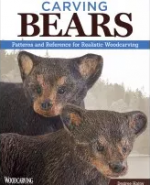 For further information about animal carving read Carving Bears and Carving Deer by Desiree Hajny. The books are available from www.foxchapelpublishing.com for $12.99 each plus S&H. 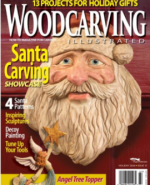 CLICK HERE to read the full step-by-step instructions and other great articles in Woodcarving Illustrated Holiday 2006 (Issue 37).